Preparing for an auction can be an exciting, yet stressful and overwhelming time. If you’re a buyer, you want to keep a cool head and ensure you understand the rules and process of an auction before bidding; if you’re a seller, you want to make sure you work with a good auctioneer and put yourself in the best position possible to secure a successful sale. 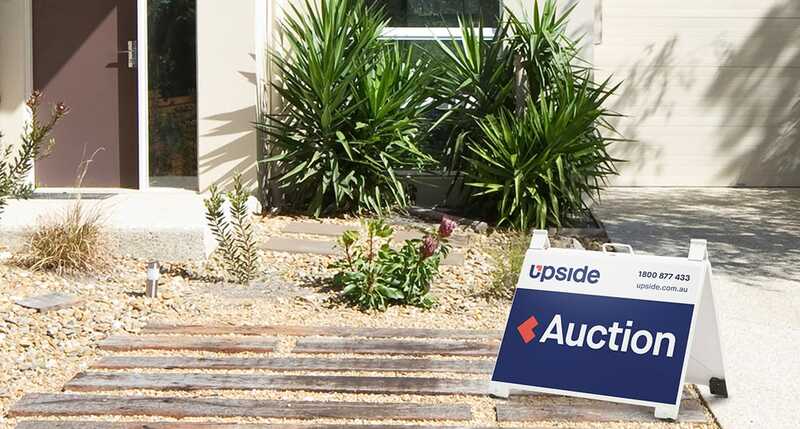 Auctions account for almost a third of all property sales in Australia, so chances are you’ve considered an auction at some point during the process, whether it’s when buying your next property or selling your home. When it comes to preparing for auction, the more well-researched you are, the better. Here, we break down everything buyers and sellers need to know about the home auction process, from preparing the sale to what happens during and after auction day, as well as some home auction tips to help make the process a success for everyone involved. Looking to sell your property and thinking about selling by auction? We've partnered with some of the best auctioneers in Australia! Talk to your experienced, local Upside agent to find out more. Choose the right agent and auctioneer. Your agent and auctioneer will have a big impact on the outcome of your auction, so it’s crucial to take time to find the right partner to help you sell your home. Choose someone with a proven track record: look at the agent and auctioneer’s recent sales in the area, and make sure your auctioneer is registered under the Land Agent’s Act. Set your reserve price. As the seller, you can set the reserve price with your agent. Look at previous auction results in the area to get an idea of how much you can expect from your property, and consider the historical supply and demand during your time of sale (for example, there are often less buyers over the Christmas period). Spend time to prepare and style your home. 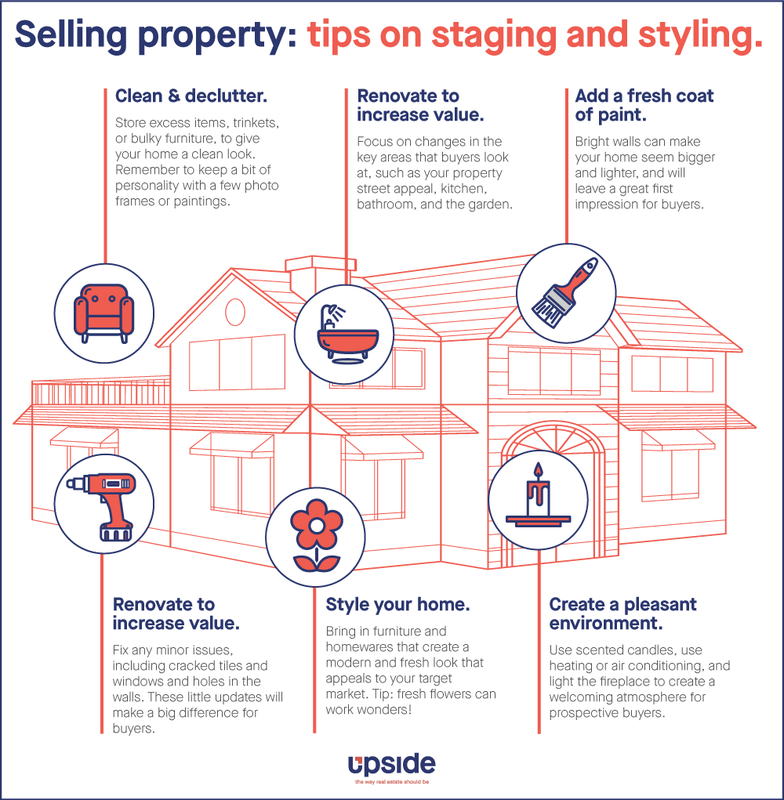 Whether it’s styling your home or making renovations to increase your property’s value, little changes can boost the appeal of your home in order to attract potential bidders. Keep your house looking nice all the way until auction day - you never know when a prospective buyer is looking. Select a suitable spot to host the auction. You want to create a welcoming environment for bidders, while also making sure that your auctioneer can be heard clearly. Usually the best spot to host an auction is the garden, or the entrance of your property. Talk to your auctioneer and agent about the process on the day. Auctioning your home is a big commitment, and the more familiar you are with the process, the more comfortable you’ll feel. Ask your agent to walk you through exactly how the auction will go, so you aren’t left in the dark during the day. Do your research before the sale. Investigate the sale prices of other properties in the area to get an idea of the reserve price, and try to find any information from the seller or the agent on how much interest there is in the property. It can also be helpful to try and find out if the seller is looking for a quick sale, or if they’re willing to put the property back up on the market again for auction if it doesn’t sell the first time around. This helps you understand how much leverage you have if the property doesn’t meet its reserve price. Inspect the property, and visit other auctions. On auction day, it’s easy to get lost in a bidding frenzy and to overlook any minor problems in the property. Inspect the property thoroughly before auction day (visit twice if you need to), and also attend other auctions to become familiar with the experience and buyer bidding strategies. Know your limits. Auctions can be emotional and stressful, and the last thing you want to do is get sucked into a bidding war where you bid more than your budget allows. Before going into the auction, it’s crucial to set yourself an upper limit – Sven Feldmann, an economist at the Melbourne Business School, suggests writing it down and putting it in your pocket as a tangible reminder of how much you’re willing to spend. Get your home loan pre-approved. If you’re funding your property through a loan, then it’s important to know exactly how much you can borrow before you commit to an amount at auction. Getting pre-approval means visiting your broker or lender so they can assess your financial situation and pre-approve you for a certain loan amount (preferably in writing). While pre-approval doesn’t guarantee that you’ll get your final loan approved, you can be fairly confident that you’ll be able to borrow that amount and use this as a budget guideline for auction. Rules and proceedings: On auction day, the agent is legally required to display documentation around the property at least 30 minutes prior to the scheduled start time. Before the auction starts, the auctioneer should also read out all the state and federal laws that apply to property auctions, as well as any rules for that specific auction. The auctioneer should also disclose if vendor bids will be used. What is a vendor bid? A vendor bid is a bid made by the seller to either help get the auction started, or to move the auction along if nobody is bidding. Vendor bids have to be made through the auctioneer, and the rules for vendor bids vary from state to state. Do buyers need to register before making a bid? This varies from state to state. In NSW, QLD and SA, buyers need to legally register with auctioneers before bidding, while in VIC and WA there are no legislations around registering. Start the bidding: The auctioneer will ask for an opening bid, and from here it’s up to buyers to bid for the property. The auctioneer and seller will set the increments for bids to rise (normally these start in $5,000 or $10,000 increments), but buyers can propose different amounts and the auctioneer can choose whether or not to accept these bids. What happens if a property reaches reserve price during auction? If the reserve price has been met during the auction, any bid that’s made from that point onwards means ownership of the property. Sell your property with an experienced Upside agent for only $7,500 for private treaty, or $8,500 for auction - including all advertising no matter how much you sell for. Use vendor bidding wisely. As the seller, you are allowed to use a vendor’s bid to get the bidding started, or to move the auction along – as long as the property is under the reserve price. If you plan on making a vendor’s bid, this needs to be done through the auctioneer and declared before the auction starts, so it’s important to establish this together before the day. Stay calm and collected. 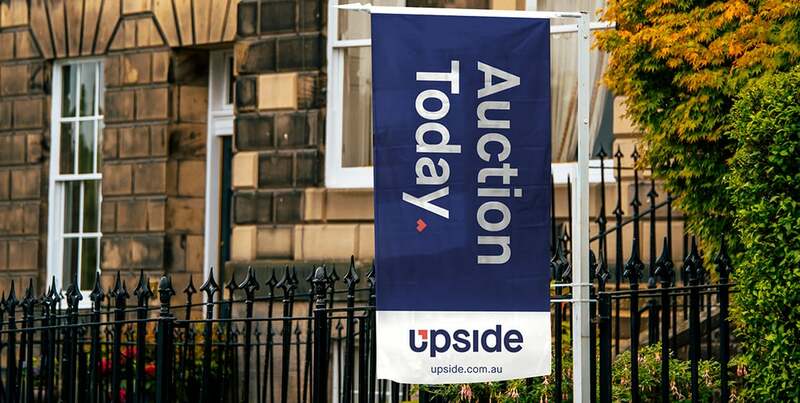 Auction day can be exciting, but it can also be underwhelming – particularly if there are no bids. Prepare yourself for the worst case scenario (that your property doesn’t sell under the hammer), and focus on the next steps with your agent and auctioneer. Decide whether or not you want to be at the auction. While it can be tempting to be there on auction day and have front-row seats to the excitement, sometimes it may be better to stay away as your reactions could influence future bidding. Know the rules and the processes. Before bidding on any property, it’s important that you’re familiar with the rules of auction. Speak to the seller to clarify the terms of deposit if you’re successful in the sale, and stick to these on the day to ensure the process goes as smoothly as possible. Have a strategy in place. Before auction day, you should have a plan for how you’re going to bid, as well as what you’re going to do if you’re the only bidder or if the price quickly goes past your upper limit. Consider if you’re willing to open the bidding and at what amount, and also the pace at which you want to bid. Keep your cool. While it’s easy to get caught up in the moment, it’s important to remind yourself of your limit and your bidding strategy. Try to remember that there will always be another house, and that bidding more than your limit can complicate things going forward for yourself and the seller. What happens after the auction is over? Congratulations on a successful auction! There is no cooling off period for an auction, so once the property has been sold, the buyer is legally required to pay a deposit on-site (usually around 10%) by personal or bank cheque. The buyer and the seller will also need to sign the contracts and agree on a settlement day where the remaining balance of the property is paid. This period is normally 30, 60, or 90 days after the auction ends. If the property doesn’t meet its reserve price, the seller can choose for the property to be ‘passed in’, which means that the highest bidder gets an exclusive opportunity to negotiate a sale price with the vendor. If the two parties agree on an amount on the day, then the process follows the same as if the property was successfully sold during auction. If the offer isn’t accepted, the seller can also open the floor up for other buyers to negotiate, or choose to relist the property on the market. The home auction process can be stressful, both as a seller and a buyer, but it can also be a rewarding experience, especially if the property is sold. With the right preparation and planning in place, you can make sure that auction day goes smoothly for everyone involved. Should I sell my house by auction? Get an experienced local agent, quality marketing and ful transparency, all for a low-fixed fee regardless of selling price. $7,500 for private treaty or $8,500 for auction. Talk to your experienced, local Upside agent to find out more.